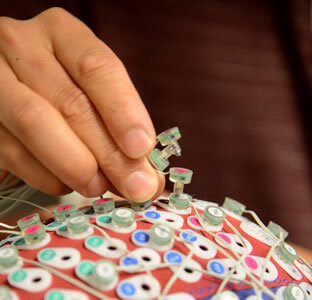 (June 29, 2014) -- A recent $400,000 grant from the U.S. Department of Defense has allowed UTSA to acquire two high-performance electroencephalogram (EEG) systems to advance research and education in the area of brain-machine interaction (BMI). Understanding how the human brain functions and how this knowledge can benefit society is both a UTSA and a national research priority. BMI, also known as brain-computer interface (BCI), is a field focused on assisting, augmenting or repairing human cognitive or sensory-motor functions. The new equipment, housed in the BMI Lab in the Applied Engineering and Technology Building, will enable several highly interdisciplinary research and educational projects in BMI and brain research led by six professors from five departments across UTSA. Yufei Huang, UTSA professor of electrical and computer engineering and principal investigator of this grant, recognized the university-wide need for high-performance EEG systems, which are state-of-the-art, non-invasive devices for measuring brainwaves in real time in both laboratory and real-life environments. Very few universities across the country have equipment of this quality. 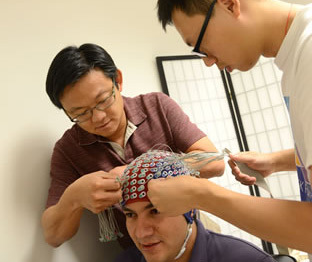 "UTSA already has a strong presence in neuroscience research and education," said Huang. "This new EEG technology will significantly enhance our scholarly contributions to advancing new knowledge in brain research. Our long-term vision is to develop a top-tier research and education center on brain-machine interaction at UTSA." Huang and computer science professor Kay A. Robbins will use the EEG equipment to develop and implement a computational system to monitor brain activities in realistic, event-rich environments. This research is part of the Cognitional and Neuroergonomics Collaborative Technology Alliance (CANCTA), a multi-institution collaboration funded by the U.S. Army Research Laboratory (ARL). Robbins also will use the equipment to capture data from the brain during attention and learning tasks in order to build a database that will help researchers see patterns in brain activity. This project also is part of CANCTA, funded by ARL. Electrical and computer engineering professor and chair Daniel Pack and Huang will use the equipment to design and implement a BMI system that uses brain signals generated by a soldier to navigate small unmanned aerial vehicles for military operations such as collecting intelligence, performing surveillance and conducting reconnaissance missions. This project is funded by the ARL. Kinesiology associate professor Wan Xiang Yao will use the equipment to examine the neuromechanisms underlying the transfer of learning from one side of the body to another and metal imagery practice, which will be helpful for patients relearning motor skills lost due to traumatic brain injury or disease, such as a stroke. Biology assistant professor Nicole Wicha will use the equipment to determine the neurodevelopmental trajectory for arithmetic fact learning in bilingual children. Mechanical and biomedical engineering professor Yusheng Feng will use the equipment to develop a real-time feedback tutoring algorithm to monitor students' brain activity when they are studying science, technology, engineering and mathematics. He also will use the algorithm to provide students with learning disabilities feedback to improve their study habits by providing vivid encouraging visualization cues. More than two-dozen UTSA faculty members and their graduate and undergraduate students are actively involved in brain research and education, many of whom are affiliated with the UTSA Neurosciences Institute, a multidisciplinary research organization for integrated brain studies. Learn more at the UTSA College of Engineering website.